Welcome to the Sixty Forth Edition of the Owen Guns Bulletin. I have began a new facebook page to assist in my campaign to re-enter our Local Council, it would be of great assistance if readers or friends of readers could go to this address http://www.facebook.com/GympieCandidateRonOwen and Click on the “LIKE” button at the top centre of the page. Councillor’s are at the trenches end of politic’s, the bottom of the ladder but it is achiveable and it gives a little more energy to our voice. We also need a new Shooting Range Complex in the Gympie Region for all diciplines. FIGHT BACK THE GUN LAWS. Is there a brave Australian politician who will support Gun Ownership in 2012? Most shooters would reply to that immediately and say, Yes, for the first time in years we have the KAP. Please read on and Act today. I have thought hard before reporting the following, as I know that many disappointed elements within the shooters fraternity will condemn me for reporting this situation. I believe that without understanding the problems we are never going to be able to resolve them. So after reading the following please contact the KAP candidates and ask for a written commitment. In truth, on the 15th November 2011, the two KAP members Shane Knuth and Aidan McLindon voted with the Independents Liz Cunningham, Dorothy Pratt, Rob Messenger, and Chris Foley against the latest Weapons Bill, which imposed even more burdens on the law abiding shooters of Queensland. All of those who stand for re-election are insured to retain their seats with a large shooters majority. We are all fully aware that Labour and the LNP, like Tweedle Dee and Tweedle Dum mer will always betray licensed shooters, as they conspired to do on the 15th November. After that event shooters began asking KAP candidates and the two elected KAP members above for their individual views on Gun Laws and what changes they would like to see made. The responses to shooters, regarding the LNP and Labour are not at all surprising, almost a 100 % non return rate, (find response on http://www.foaa.com.au/index-of-candidates-responses-on-gun-laws/ ) but we are all amazed at the poor response from the KAP candidates with only Ade LARSON KAP for Southern Downs with a perfect score of 60 points and very guarded ‘strange’ answers from three other KAP candidates and nothing from the vast majority. When discussing this with KAP candidates the general answer is, “The KAP policy on Gun Laws has not been released as yet”, when it is pointed out to them, that we vote for a person not a party and the questionnaire asks for their personal views, and that they seem reluctant to let the shooters know what they are. They become more ‘chatty’, but still no final results. This leads us to conclude that the KAP policy is not what the majority of shooters in Queensland have been hoping for and there will be a lot of gnashing of teeth and disappointment if this policy is released. Let us hope that the candidates can get it changed before it is released. 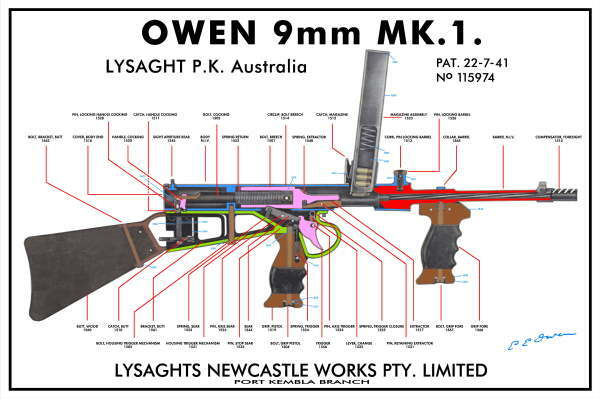 Last week, a Brisbane Firearm Dealer phoned me and asked me to take down the information sent by Ade Larson from the www.foaa.com.au website. 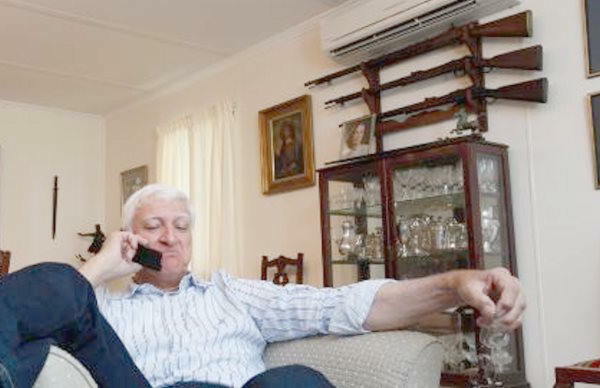 As he had been asked to convey that to me from Rob Nioa, who had told him that he was working on COAG to drop restrictions on the import of Category C firearms, as we all wanted Pump Action Shotguns to be on sale again. That if they saw that KAP was too pro gun and wanted to get rid of registration that they would not come to the party on the Cat C Shotguns. I refused and asked him to ask Robert to phone me himself. Then 15 minutes later, Luke Shaw from KAP Brisbane headquarters phoned me and asked me to take down the information from Ade Larson from the www.foaa.com.au website as it conflicted with KAP policy and that the media might pick on the KAP due to his response. Which was a different story. I asked him to send me a copy of the KAP policy on Gun Laws. He refused, stating that it had not been released yet. I asked him what was wrong with one of their candidates having a different opinion on Gun laws than the KAP policy. He answered to the effect that they had to have a unified approach. I asked him if this was a new policy as originally the party put it out, that their members in parliament could vote with their conscience, and already it seemed that there were restrictions on expressing that conscience. This did not cheer up Luke, he expressed the contention that they did not want the general public to think that their party was a pro gun party. I explained to him that they had done that already, that the media had given prizes for the photo of Bob Katter with his guns on the rack behind him, and that the story of Rob Nioa his son in law shooting the zoo, was carved in concrete. That surely they wanted the support of shooters, and if they had a good policy on Gun laws that they might get a good candidate for Gympie but without it they had no chance. I reminded him that the Shooters had kept the National Party in Government in Queensland for 30 years and when betrayed they withdrew that support which had kept them out of power for 14 years. I told him, that as of now over 60 % of shooters were convinced, that KAP was the ‘Great Hope’, for their future and were prepared to join and put out a lot of effort to KAP to ensure their success, but already they were questioning and looking for some firm commitment to change the legislation. Everyone wanted the end of Long Arm Registration, they had suffered under it long enough and it was the main reason for slow Pistol PTAs. As it had been removed in New Zealand and Canada and the billions of dollars cost of it for no results had already been published by the Main stream media that was very acceptable to the general public. He made comment that he did not believe that individual shooters had the right to contact all of the KAP candidates to establish their opinions and said that shooters should contact head office and get the one answer. I answered that any voter had the right to contact anyone they liked. particularly a person standing for an elected position. That it was their right, so they could judge how to vote at the next election. I informed him that as “President of the Firearm Owners Association of Australia my loyalty was to the shooters and it was my duty to represent their position. 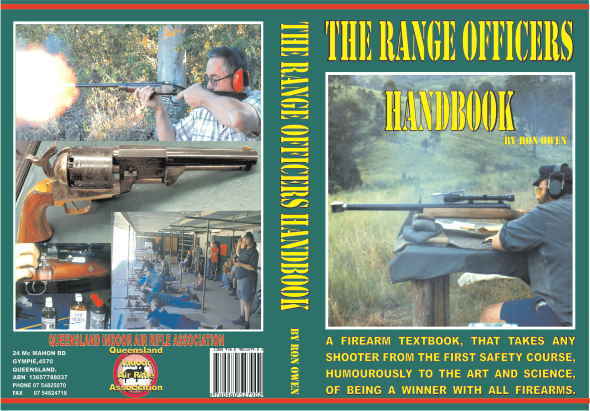 That I wished the KAP all the success and would continue to hand out their brochures on the counter and pin up their posters, but would alway advise every shooter to ask the KAP for a firm commitment to dismantle the Long Arm Registry as without it they would gain very little from the KAP. We would be voting for the best of the three worst options. If the KAP did very well in the coming election, it would feel that it could do well without making any commitment to shooters and if they had no success then the media would blame the shooter elements within the party.” Either way no further ahead for shooters. We agreed that we disagreed and left it at that. Luke, sounded to me like every other party staffer that I have spoken to on this issue over the last 30 years. If you have not asked the Candidates your Questions please do it soon, as it is for all of us. We have an imminent State election, please join with the other shooters and cut and paste all the candidates email address http://www.foaa.com.au/email-mps-candidates-list/ into a blank email form. (In one block, takes a few seconds) and then cut and paste the questions from http://www.foaa.com.au/questionaires-for-politicians/ Hit the send button. It informs those who will not answer that there are shooters, shooters friends and their families who will not vote for them. Don’t hold your breath for any worthwhile replies but any that you do get please forward them to owenguns@spiderweb.com.au As the more they get, the greater chance we have that they might change their opinions. In 2012, shooters interested in accuracy will find rifles capable, (with the right conditions and loads) of shooting half inch groups at 200 yards, off the bench, or even better. Captain Land reports that the legendary Sniper, Gunnery Sgt Carlos Hathcock’s (most decorated sniper of the war in Vietnam) rifle barrel looked like it had been sandblasted inside and out. On the inspection sheet, the armourer would say, ‘Slight pits throughout.’ His rifle would hold about two minutes of angle. That’s 20 inches at 1,000 yards and that’s what he had to work with. The rifle a Winchester Model 70 with a target weight barrel and a 8X Unertl scope. Captain Land said, “We had M1 c s and M1 d s available that would hold a minute of angle, but they didn’t maintain their zero.” Capable of shooting a tight group but either the mounts or the adjusting reticles would move. Captain Land said, “The Unertl scopes would not have lasted an hour in the hands of regular Marines. Carlos had excellent results with that scope, but it was only because he understood it and he knew how to take care of it, and he was very meticulous in doing so. The major problem (they snipers) had with it was that if you got careless, it would fog up on you. Anytime we came back off of a patrol, the scopes would be put in a hot box to dry them out.” The other problem was crosshairs blowing out under the recoil. Captain Land said one of the armourers, Vic Johnson, kept a box of spiders to spin the filaments for replacement crosshairs as a field expedient. 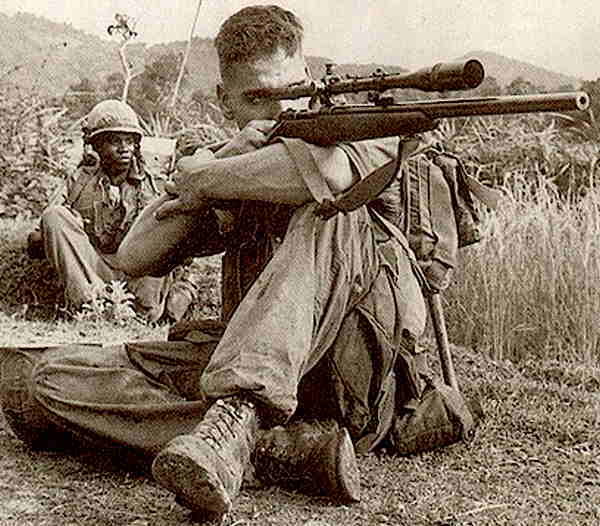 Before leaving Vietnam in 1966, Captain Land set up the initial testing program for what would become the basis for all Marine Corps sniping rifles for the foreseeable future: the 7.62 NATO (.308 Win.) M40, built by Remington with considerable design input from Marines in the field. After so much success with the Winchester Model 70 why did they go to Remington? Of the commercial actions available, why not the Winchester Model 70? Why the Remington? Captain Land said, “Remington really went out of their way to help put this together. They created the stock with the cheekpiece on it; they never had this heavy a barrel in this stock. (Up to that time all heavy barrels were only made for Prone Compeititon, like the Omark) We had the scopes sent in from Redfield. Remington mounted them, tested them, and they were put in a specific case and shipped to Vietnam or to Quantico.” This was the rifle used by Carlos Hathcock in his second tour of duty. 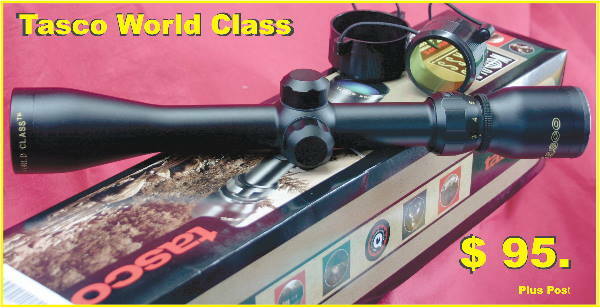 The Redfield 3-9X variable scope for those initial M40s were produced in two finishes, green and deep black. Ostensibly they had a built-in rangefinder, which Captain Land said was “worthless,” because it often melted in hot sun. Captain Land calls the Remington M40 a “Pretty good interim rifle, which saw a lot of use. The main problem was the stock, which swelled and touched the free-floated barrel when it got damp or wet.”Captain Land said that when he left Vietnam, the M40 was fast replacing all other sniper rifles, from the Special Services rifles to the target-grade Winchester Model 70s to the M1s in various configurations. The knowledge gained with the Remington M40, led to design of the M40A1, a rifle Captain Land says is the most accurate he ever owned. Made in the Marine Corps’ precision rifle shop, it had a finely tuned Remington 700 action, McMillan fiberglass stock and custom heavy McMillan or Sinclair barrels. He said that when first issued it was topped with the Redfield 3-9X. But a variation was created for the 2nd Force Reconnaissance Unit that mounted a Weaver T-10. Later, the rifles were re-scoped with special, strictly Marine Corps, 10X Unertl scopes. Later we will discuss why not variables. Next Edition Free Floating Barrels and Bedding. 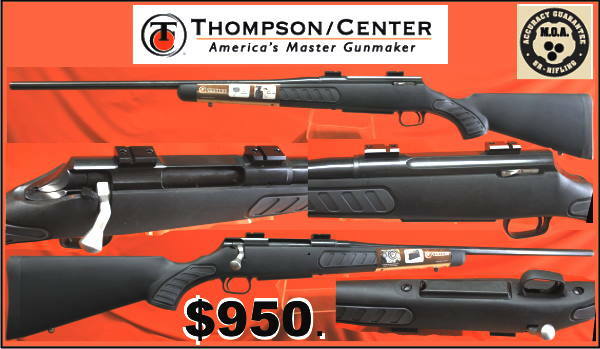 The Mossberg Maverick has everything you need, pinpoint accuracy, smooth action and big-game calibers. The rifle is offered in four widely popular calibers: .270 Win, .30-06 Sprg., .243 Win and .308 Win., and features a free-floating, 22 inch button-rifled barrel. A Black Synthetic Stock. Weaver styled scope bases. This powerful combination delivers a high level of accuracy unheard of in a value-priced centre-fire rifle. A side lever safety is utilized for convenience and safety afield, and the all-steel, machined receiver provides the Maverick with positive lock-up for consistent operation. This rifle delivers high performance without the high maintenance. 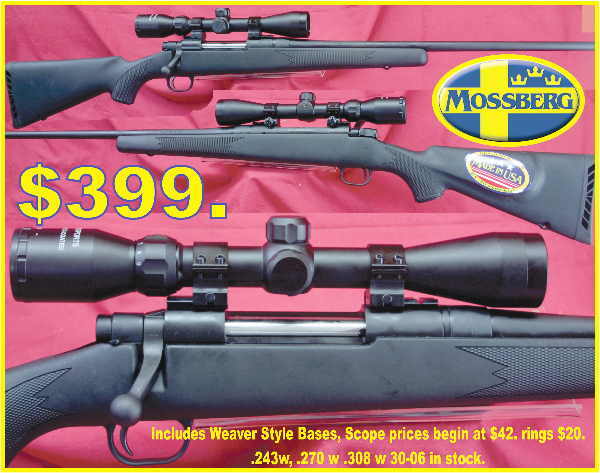 For generations, Mossberg has built reliable, quality firearms at an unparalleled value. This American-made bolt action rifle is the first they have introduced in over 20 years. Blink and it’s a Savage or a Stevens and very similar to the Marlin. Just better priced at $399. plus post If you want to order by mail Phone 07 54825070 have your card detail handy . plus postage. If you want to order by mail Phone 07 54825070 have your card detail handy. We learn new things every day, and yesterday something could have occurred to change this information, but all we can do is run with what we know now at this point in time. There are actually only two sizes of Boxer primers standardized through out the World, large (.210″ nominal dia.) and small (.175″ nominal diameter). Each size is divided into both rifle and pistol types, thus “Large Pistol,” “Large Rifle,” etc. In addition, there are “Magnum” and special purpose types within each size. 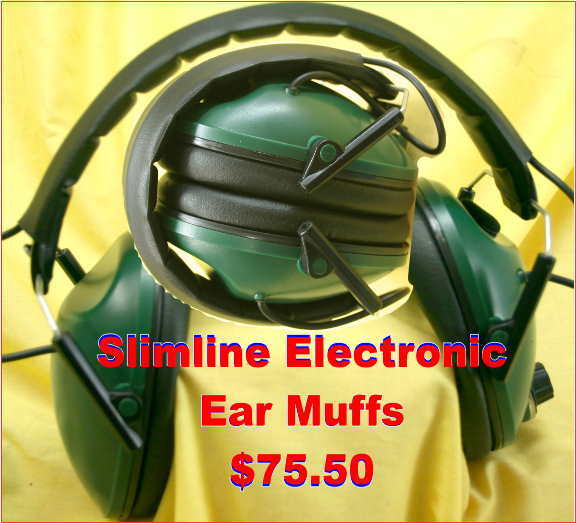 There are some larger sizes, but they exist only for military use in heavy automatic weapons ammunition. 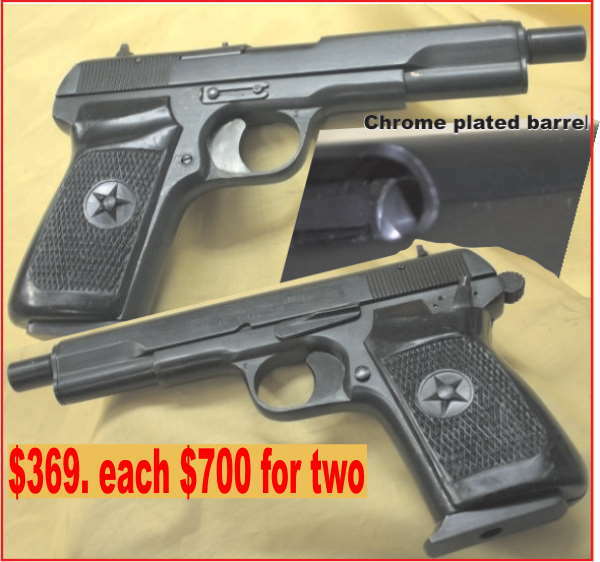 Pistol and rifle primers differ only in that the former generally contain less priming compound (being required to ignite smaller powder charges) and are assembled in thinner, softer cups. Pistol firing pins and hammers cannot produce a great deal of energy, so the cup must be relatively weak to be easily dented. Fortunately, pistol cartridges develop relatively low pressures which can be confined by a weak cup. On the other hand, the heavy, powerful firing mechanisms of rifles can easily indent the thick, stiff rifle primer cups. So in many cases using pistol primers in rifles could cause the firing pin to penetrate the cup, allowing hot gas to pass very quicky along the firing pin channel into your right eye. So it is not recommended. On the other hand the pistol primers might not burn the required amount of slower (for Rifles) burning powder, causing variable results. Using rifle primers in a handgun, could up the pressures, if your firing pin sets them off. Again not worth the trouble. Shotshell primers have also been standardized dimensionally in the past decade. Before that there were two major sizes and a couple more not so prominent. 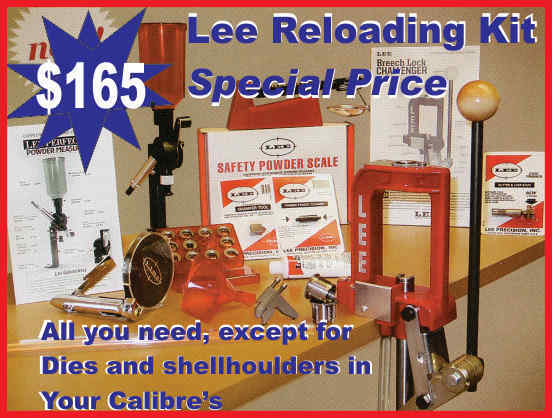 I have seen steel cased 12 gauge use a large Berdan Primer. Now one size, that previously referred to as “209-size,” is used in all plastic cases that we see today. The brass on the bottom of a 12 gauge case takes up no useful purpose except for ‘good looks’ as we were using full plastic mono hulls in the 1970s and I reloaded many of them 8 or 9 times. Many times it is not even brass just a pressed steel cap which is electro plated to look like brass. One of the reasons the case can safely be made of plastic is that the battery cup primer is enclosed in a steel reinforcing cup. This was designed in that manner due to the earlier inherent weakness of paper shotshell construction. The cup confines the primer proper during firing so that it does not expand and destroy its seat within the case even if it is made of cardboard or plastic. Within the primer is a separate anvil, it is sandwiched between the bottom of the battery cup and the primer cup or “cap,” as it is often called. When the cap is indented by a firing pin, the pellet is crushed against the anvil and ignites, flashing flame through a hole in the bottom of the battery cup to ignite the propellent charge within the cartridge case. Next Edition, The Manufacture of Primers.